The impetus for this post arises from a call for blog submittals on the topic of “Cities and Sustainability” for the Abu Dhabi Sustainability Week Conference. Here I propose that community is a necessary part of sustainability. While the environmental advantages of urban living remain unintuitive to some – a vestige of an earlier environmental movement belief in the virtues of living off the land — anyone who has looked into ecofootprints (or carbon or water footprints) knows that urban dwellers consume significantly less resources than do suburbanites or even most rural denizens. We travel shorter distances, more often by foot or mass transit than by car. Our homes are smaller and stacked, requiring less material to build and fill them with as well less energy to heat, cool and light them. The primary downside, perhaps, is the need to import most of the food supply. But this, too, may be a misplaced criticism since so much of the food supply is grown globally. If anything, then, the transportation and distribution of food is more efficient in cities than in spread out development. And for local, seasonal crops, we’re seeing a growing movement to urban gardens, which have the potential to provide a portion of food needs along with “reconnecting” urbanites to nature (addressing the Thoreaus amongst us). So the rapid urbanization of the population is, in many ways, an environmentally positive – even necessary — event. Too often left out, however, is the question of what life in these cities is or will be like, and this has at least two significant implications for sustainable development. 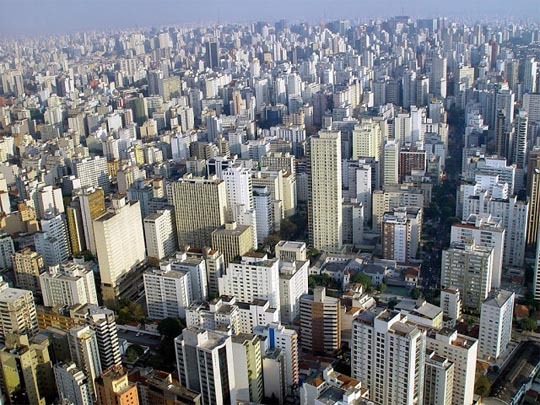 Modern urbanization has taken several physical forms: horizontal expansion of low-rise districts, vertical densification where geography limits outward pushes, and ground-up creation of entire new high-rise cities. What most of these lack, due to the artificial influences of zoning, economics and modern architecture, are the street life and vitality of older cities. The tendency, even in the greenest buildings, is toward characterless and anonymous (or, alternatively, monumental) structures that pay little attention to the street or the community. A resulting combination of a lack of pride of place and, as I have written previously (1, 2), design that discourages neighborhood interaction, leads to a diminished sense of community. This loss of belonging to something larger than one’s self contributes to the perception that environmental issues, both local and global, are someone else’s problem. This also has bearing on the potential for another positive environmental movement: the sharing economy. Sharing objects and services means less consumption has to take place, saving both resources and money. The good news is that urban living, by definition, has a good deal of sharing built into it: sharing of lobbies, floors and ceilings, of sidewalks, parks and transportation. But the possibilities are greater, ranging from tool libraries and community gardens to cars, communal cooking and guest facilities. These are often a part of what’s come to be called “intentional communities” such as cohousing where people band together to form communal groups. But urban areas in general have great potential for sharing, due in no small part to proximity and convenience – so long as a community exists that is conducive to sharing. There is a reinforcing loop present in this. A strong community sets the stage for sharing, and sharing tends to strengthen the community. We know that cities objectively represent a more viable path to sustainable development than either suburban sprawl or off–the-grid lifestyles. The much needed — and too often missing – part is attention to the quality of urban life, particularly as cities get denser. Density can be justified on both environmental and economic grounds, but true sustainability demands more. This is the premise behind what I call EcoOptimism: solutions that symbiotically address ecological and economic issues while also improving our lives. 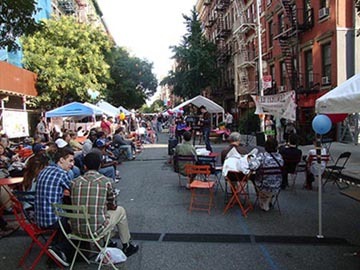 Urban living, if developed with people and community in mind, is perhaps our most fundamental EcoOptimistic path. This entry was posted in Architecture, Community, Policy, Role of designers, Urbanism and tagged community, density, win-win-win on January 1, 2014 by David Bergman. The US federal government is broken and international agreements, it seems evident, are not about to happen any time soon. How then can global problems like climate change and pollution be tackled? The ineffectuality of large-scale top-down governments, at least as they currently exist, leaves us with two possible, non-exclusive routes: a bottom-up popular approach and, perhaps counter intuitively, a corporate driven approach. We see some evidence of the latter, albeit not nearly enough, in programs from Walmart and a few others to enforce environmental requirements on their supply chains, and in the growing endorsements by some energy and related companies of some form of a carbon fee. This business world trend, which is occurring in spite of the oversized voice of the US Chamber of Commerce, is a very positive sign in that it exposes the knee-jerk claims that a carbon tax would be a job and economy killer. But I want to concentrate here on the other option, creating public demand for environmental thinking and responsibility, because this is potentially the most likely route to both engaging public support and, by extension, electing governments that respond to that demand. “Resilient communities” has become a major theme in environmentalism. The basic concept is to create ways by which communities can prepare for and respond to disasters, natural or otherwise, with less reliance on others, including national governments. It’s a fine goal (though it won’t and isn’t intended to obviate the need for wider scale programs). But the concept ignores a first step that is both necessary and desirable: before you can make a community resilient, you have to have a community. I started writing about this topic in the post Community and Sustainability. My basic premise is that neighborhoods that don’t have a sense of community, almost by definition, are not conducive to fostering individuals’ interest in topics or problems with impact beyond their own self-interest. 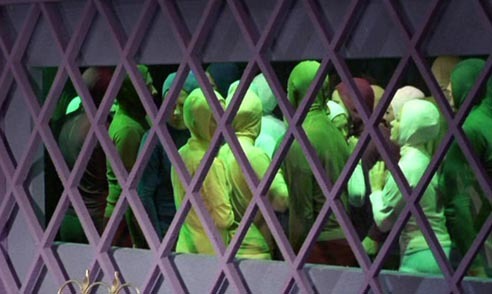 Living (or working) on a block or in a neighborhood where anonymity is the rule discourages any sense of ownership, of belonging to something larger than just you. Simultaneously, this means you have less incentive to participate and less sense of responsibility to a community. This can contribute to any number of “quality of life” problems like noise and littering. If you don’t know your neighbors, you’re less likely to care. A starting point is asking why, in so many places, it seems we don’t have strong communities. Though it may be partially a product of nostalgia, we commonly hear that communities used to be more important and more central to people’s lives. Reasons for this abound, ranging from the trend away from extended families living in proximity, to fewer stay at home moms (as was the social and economic norm back then), the loss of local coffee shops and watering holes and, of course, the advent of the Internet. The common factor in all of these is that there are fewer places and occasions for in-person interaction: fewer places to meet your neighbors, fewer chances for unplanned exchanges. I’ve been pondering this while looking at current and proposed developments here in NYC and elsewhere, and comparing them to urban streets like my own. New urban apartment buildings and their streets bear little resemblance to the low-rise walk ups on my block. 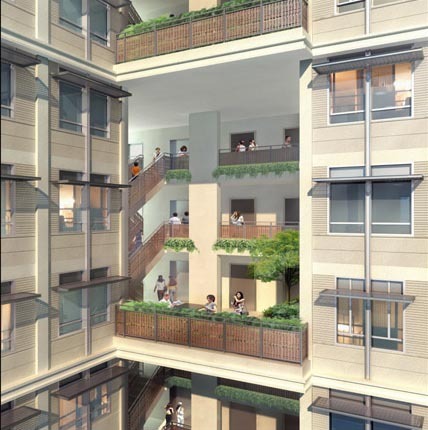 Aesthetics aside, there is a huge difference between a block-long building containing a hundred or so apartments entered via a single massive lobby, and a series of varied buildings with each with a dozen or two units, with entrances (perhaps on those quintessential gathering spots called stoops) every 25 feet or so. Add to that the difference between streets lined with a combination of generic large chain stores with ubiquitous bank branches versus smaller local businesses run and staffed by people in the community. As I’ve been emphasizing in several recent posts here, particularly Towers in the Block and the series on density, we need a re-envisioning of design, both urban and suburban, with an eye toward community and livability. We need to reinvestigate the older ways of fostering community and devise new interpretations that take into account increasing density, new construction methods and economic realities, and new social patterns. Without this, we run the risk of continuing and expanding the anonymity and attendant self-focus of modern urban and suburban life styles, resulting in a population closeted in their homes and, when they emerge, being further isolated in their cars or their headphones. That self-focus, it can be argued, is the root of many of our political problems as well as our inability to deal with environmental issues, and is at least in part an outgrowth, a fault, of the physical structure of our non-communities. This entry was posted in Architecture, Community, Role of designers, Urbanism and tagged density on October 24, 2013 by David Bergman. If Overpopulation Isn’t the Problem, What’s the Question? In a commercial for Doritos some years back, the consumption-encouraging slogan was “Eat all you want; we’ll make more.”* That guilt free line, with some minor alteration up front, could also be the subtitle for Erle C. Ellis’s New York Times Op-Ed “Overpopulation Is Not the Problem.” Basically he says we can have as many people on the planet as we want because we’ll always find ways to make more food. Sounds like music to the ears of an EcoOptimist, or at least an optimist: evidence that centuries of fears of overpopulation have been wrong and the idea of a “carrying capacity” is irrelevant. Problem is it’s neither correct nor an example of EcoOptimism. In a previous post, I refuted an EcoPessimist. 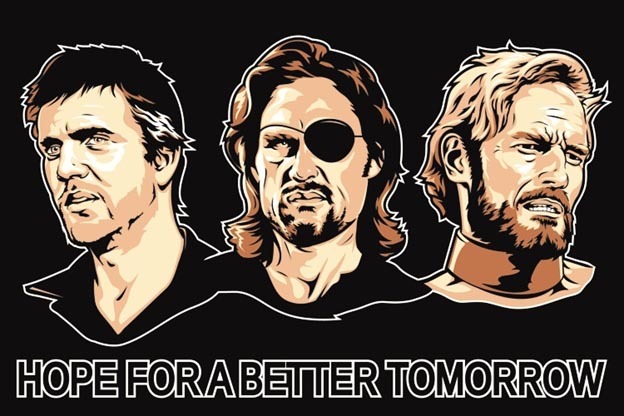 Now I need to refute a false optimist. Since the end of the 18th century, when Malthus wrote An Essay on the Principle of Population, there’s been controversy regarding the concept of “carrying capacity,” or the maximum population that an ecosystem (or the planet as a whole) can support indefinitely. Carrying capacity can refer to any species, but what we’re usually talking about is humanity – how many people the planet can support. Malthus and his followers concluded that, largely because the Earth is a finite system, there are only so many people who can be fed by its resources. The 1972 book The Limits to Growth expanded upon this and predicted, as population and consumption grew, we’d run out of other necessary resources as well as food. When the estimated dates passed without the shortages and human calamities the authors described, opponents claimed that it proved the concepts of finite resources and carrying capacity were wrong. Economists had an economic explanation – that scarcity would drive up prices which would, in turn, create demand for more expensive or alternative sources. This is, in fact, what is happening with fossil fuels; “unconventional” fuels like tar sands used to be too expensive but now are becoming viable as cheaper sources of oil run out. The problematic assumption here is that there will always be interchangeable alternatives. Some resources are simply not replaceable. Try living without oxygen or water. Other opponents had a different take. Scientific and technological advances, they said (and still say), will continue to bring us new solutions which will allow us to increase efficiency as well as find alternatives. Natural resources may be finite, but that doesn’t matter because our intelligence will always yield new ways around those limits. This in short is Ellis’ thesis. “There really is no such thing as a human carrying capacity,” he writes. The idea that humans must live within the natural environmental limits of our planet denies the realities of our entire history, and most likely the future…. We transform ecosystems to sustain ourselves. This is what we do and have always done. Our planet’s human-carrying capacity emerges from the capabilities of our social systems and our technologies more than from any environmental limits. This inherently optimistic and appealing view has, though, a couple of fatal flaws. It is based on a “don’t worry, be happy” attitude that technology will always come to the rescue. While it’s true that human history has largely been one of advances leading to immense growths of population (as well as living standards), it’s a huge leap to assume that, unlike natural resources, our potential to think our way out of problems is limitless. Yes, technology has in the past changed the planet’s carrying capacity for humans (provided, that is, we ignore the long and continuing history of famines and overcrowding). Banking our future on this, however, is a form of blind faith. But let’s take that leap and suppose that technology will always come to the rescue and provide ways to ever increase the amount of food we can eke out of the planet. Food is not the only limit on human population growth. The technologies that comprise modern industrial food production, and that have allowed us (or perhaps encouraged us) to increase the human population from 1 billion to 7 billion in little more than 2 ½ centuries, demand vast amounts of not just land, but other finite resources, most notably fossil fuels for energy, fertilizers and pesticides, along with fresh water. (Let’s leave the highly debated question of whether organic agriculture can feed us to another post.) Sure we’ve figured out how to make land more productive, but it’s involved adding a lot of additional energy and resources. Plus there are the crucial issues of pollution from the runoff of those fertilizers and pesticides, and soil degradation from intense monocropping. And then there’s the not-so-small point that Ellis’ entire outlook concerns only human carrying capacity, not the ability of any of the other billions of species on the planet to survive. This isn’t just an altruistic concern; many of those species are essential to the functioning of ecosystems – the same ecosystems that enable human survival. Even in this newly-crowned Anthropocene Age, it’s not just about us. We may have the unique ability to alter the planet, to “transform ecosystems to sustain ourselves,” but that doesn’t mean we have either the right to do so for our sole benefit or the intelligence to do so with enough foresight. Ellis’s rationale is both hubristic and dangerous. He’s betting that an historic pattern will continue, without acknowledging that the game has changed so the pattern no longer applies. A strong competing view says that the Industrial Revolution and the agricultural revolution that resulted from it were a once-in-a-species-lifetime event, enabled by a world that had a combination of relatively few people and plentiful, easily accessible resources. Neither of those conditions exists anymore and the latter will not happen again in any conceivable human future. It’s not that we, the anthros of the Antropocene, are powerless. We have the ability to alter both the planet’s path and our own. On that, we agree. Is he advocating, though, that we should continue increasing the human population because, well, we’ll always have the ability to innovate and “make more” so it’ll all work out? That’s an incredibly huge gamble and, furthermore, begs the question: why should we take it? Even if he’s correct in his wildly unsubstantiated claim that “There is no need to use any more land to sustain humanity — increasing land productivity using existing technologies can boost global supplies and even leave more land for nature,” why would we want to continue to increase the population? What’s the upside? Wouldn’t it be much wiser and more beneficial to not go down that questionable road and, instead, apply our unique innovating abilities to ensuring that future generations can not only exist, but be better off? Overpopulation may not be the problem, but it certainly is a part of the problem. The famous (in some circles, anyway) equation I=P*A*T states that environmental impact is a function of the population times the amount and types of things people consume. What we have now is a rapidly growing population with a rapidly growing per capita consumption rate. Whether or not the planet’s ecosystems can sustain the exponentially increasing levels of environmental impact we are inflicting on it – and I can’t believe Ellis would say they can – diminishing that impact has to be a good thing. Maybe, maybe we can manage to figure out ways to feed everyone, but what about all the additional demands that accompany a larger and more affluent species. If we extrapolate from history as Ellis claims we can, it’s obvious that the demand for “stuff,” whether it be basic food and housing or designer jeans and the latest electronic gizmo, is increasing at least as fast as the number of people demanding that stuff. How that can possibly be construed as anything sustainable or “not the problem” is incomprehensible. The two-fold solution involves reducing both consumption and population growth, resulting in a wholly desirable scenario that, as EcoOptimism espouses, leaves us all better off and happier. As with the Doritos line, Ellis says we’ll just “make more.” He’s almost certainly wrong — we can’t continue infinitely to make more, no matter how imaginative and innovative we are – but moreover, making more is the wrong response. It’s not the route to “creating a planet that future generations will be proud of.” We need to make better – better things, better food, better education, leading to better people — not more. This entry was posted in Economics, Policy, Uncategorized and tagged consumption, density, growth-economic, growth-population, happiness on September 17, 2013 by David Bergman. The urban historian Kenneth T. Jackson is a towering figure among New Yorkologists, so it seems appropriate that he’d be a supporter of towers themselves. In an Op-Ed this Sunday in The New York Times, he takes to task the opposition to the proposed upzoning of East Midtown in Manhattan. New and taller construction is necessary, in his vision of NYC’s future, in order to maintain the city’s pre-eminence. Buried in this belief are two huge and, I believe, mistaken assumptions. The first is the basic premise that NYC must be pre-eminent. While it sounds irreverent and disloyal to say otherwise, the fact is that NYC is but one of many major 21st century urban centers. We are no longer in a world dominated by New York, London and Paris, and haven’t been for a while. (Though midtown Manhattan is still the largest central business district in the world, at least according to Wikipedia.) True, NYC is still seen as the financial capital of the world, but in many ways this is vestigial in a digital and globalized scenario and, furthermore, it’s highly questionable whether it’s in the city’s best interests to remain focused and therefore dependent on a single “industry.” Many have argued for the economic diversification of the city, with an eye to the income and job generators of the future: creating more baskets for the eggs, etc. Potential growth sectors that have been discussed, in addition to silicon alley, include sustainable design and related industries, distributed manufacturing (MakerBot originated in Brooklyn), biotech, urban agriculture and, of course, the arts. 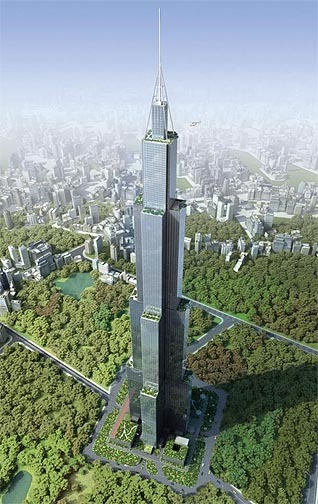 But why are height and the city’s ranking in numbers of tallest buildings the determinant of growth and importance? The essential defining property of a city is density: a concentration of people that enables commerce, community and exchanges of ideas. But like most things, there is a point at which density (of people, buildings and traffic, not to mention bank branches, Duane Reades and Starbucks) reaches diminishing returns and begins to undermine the attributes that constitute the vitality of a city. Jackson claims that density in Manhattan has decreased from a population of 2.3 million in 1910 to 1.6 million today. But that’s a very misleading way to define density. It excludes the additional 1.6 million people who commute to work in the city every day, as well as the number of tourists. 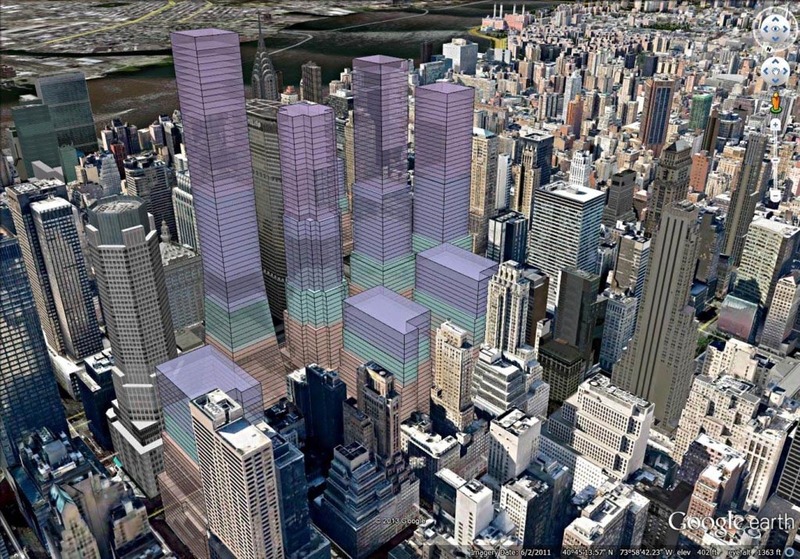 And the East Midtown upzoning plan is not designed to increase residential space; it’s for commercial towers. This will effectively worsen a basic problem of Manhattan and many cities in general: the separation of working and living areas. This results in what are perhaps the two greatest problems of modern cities: expense of living and transportation congestion. According to an NYU Wagner Rudin Center report, “Manhattan is the top work destination in the country for ‘extreme commuting,’ work trips that are more than 90 minutes long each way.” And as many of us are all too aware, NYC is the most expensive place to live in the US, all of which would lead to the conclusion that the city needs more living space, not office towers. 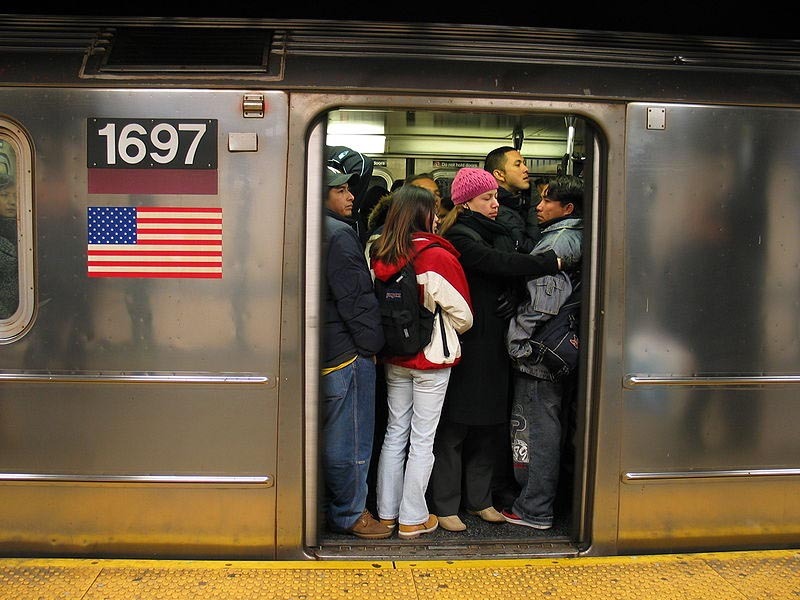 Regarding transportation, Jackson blithely puts aside another extreme: the crowding on the existing east side transportation infrastructure, claiming the MTA “could handle more, not fewer, riders” based on the statistic that ridership has fallen since 1947. Try telling that to any rush hour rider. In a breath, he ignores the fact that there were two more train lines on the east side then (before the Second and Third Avenue Els were demolished) and merely says that the long-awaited and far from finished Second Avenue subway will relieve some of the congestion on the crammed Lexington line. The city’s thinking is that replacing these buildings is not economically viable for developers given the existing zoning limitations. Given the coziness between developers and the Bloomberg administration, one has to take with this a grain of salt. Is New York still the wonder city, the place that celebrates the future, the city that once defined modernism? Or should it follow the paths of Boston, Philadelphia, Charleston and Savannah in emphasizing its human scale, its gracious streets and its fine, historic houses? The answer for a metropolis competing on a global scale must be no, because a vital city is a growing city, and a growing city is a changing city. Leaving aside the question of what’s wrong with the human scale and gracious streets (btw, I’d substitute “livable” for “gracious”) of Boston or Philadelphia – or, for that matter, Paris — Jackson has reduced this critical issue to a false dilemma. The choice is not solely between economic vitality and quaint neighborhoods. Nor is it between unbridled development and historic preservation. For cities to succeed economically, environmentally and socially, we have to look at a wider, more holistic picture than simply the one that gives us the tallest buildings and the most claims to the “greatest city.” We have to include affordability, reducing inequity, increasing livability and, yes, a sense of history. These are not the constraints Jackson seems to regard them as. They are the sources of our future “growth” and our flourishing as individuals, as communities and as a world. This entry was posted in Architecture, Community, Economics, Politics, Transportation, Urbanism and tagged density, growth-economic, Kenneth T. Jackson, NYC, urbanism on September 3, 2013 by David Bergman. Wouldn’t you know it. On the heels of my recent post, “Density: It’s not the Sky that’s the Limit,” a significant new book on the topic of urban growth has emerged. 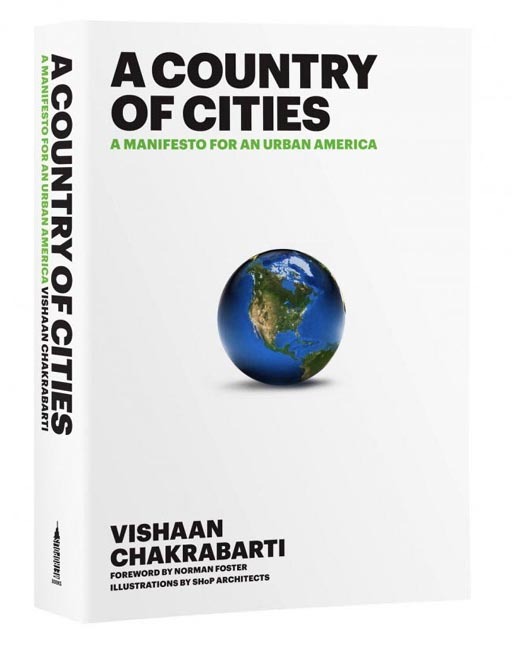 A Country of Cities: A Manifesto for an Urban America is written by Vishaan Chakrabarti, former director of the Manhattan office for the Department of City Planning and currently the director of Columbia University’s Center for Urban Real Estate as well as a partner at SHoP Architects. Chakrabarti, with a jaw-dropping background in architecture, planning, development and engineering, has had a major role in the rezoning and, in many cases, the complete re-imagining of entire sections of NYC. “Compared to most forms of human habitation, dense cities are the most efficient economic engines; they are the most environmentally sustainable and the most likely to encourage joyful and healthy lifestyles.” As you might expect, no argument from me there. Much of the debate about the “delightfulness” or the life of cities focuses not just on their density, but on the physicality of their density. In plain English, is the city made of high-rise or low-rise buildings? Chakrabarti says there is a bias against high-rises, which he attributes to their being (or perceived as being) the products of private sector, wealthy interests. Here in New York, it’s a common lament that the mallification of the city is a result of pro-development planning policies coming out of an administration led by a multibillionaire businessman. At the opposite urban scale, we have the idealized, romanticized, street-scaled Greenwich Villages and Parisian Left Banks. Chakrabarti argues, though, that those are no less the result of private interests (“built by powerful development interests and typically fueled by unsavory capital”) and, furthermore, were constructed at lower, walk-up heights only because of the technical and structural limitations of the time. They generally deride places such as Tokyo, Hong Kong and Singapore as being too congested and characterless, the products of mindless real-estate development, inept urban planning and, of course, impoverished (read, non-Western) civic culture. Implicit in such parochialism is the proposition that only Western civilization can — and will — produce superior urbanism, indicating a willful contempt for the fact that many Asian cities are outpacing European capitals not only economically but also in terms of cultural production, mass transit, environmentalism, racial integration and other key metrics. 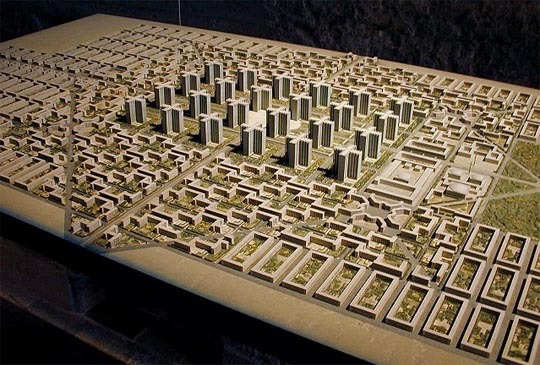 It is unrealistic and irresponsible for any true urbanist to embrace European capitals as models for future development when they are among the most segregated urban centers on earth and have increasingly unstable finances characterized by debt-driven grands projets. I think he’s off the mark here. First, most planners would see, not Tokyo or Hong Kong, but Houston or Dallas as the “products of mindless real-estate development” and not exactly evidence of some sort of Western superior urbanism. Further, how can he refer critically to European grands projets (didn’t those pretty much end after the Louvre expansion?) 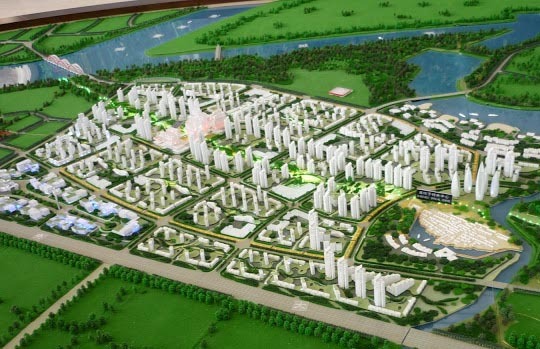 in the midst of the far, far larger projets of the Chinese new cities? These weak points, though, are an unfortunate diversion from his broader and more significant observations on the high-density, low-rise cities that predate the new millennium versus the high-density, high-rise cities we now see evolving. Amidst the diagrams of various configurations of urban density, he makes the statement: “Today the global economy demands that we embrace large buildings….” However, we’ve heard mixed messages on this. On one hand the massive urbanization of the planet’s growing population pretty much demands that urban density increases. That would seem physically obvious; urban space is often limited so there’s no place to go but up. But what of the studies showing that less vertical cities – Los Angeles is the common example – may have higher densities than, say, New York? Or that the entire population of the planet could reasonably fit in an area the size of Texas? Not that I’m advocating we build a Texas-size Los Angeles, or anything remotely like that. Gawd, no. But I don’t think he’s quite made the case for a Dallas-sized Hong Kong either. There’s also the argument that urban real estate and development costs require intense use of land for profitability. But some question the actual numbers of that rationale. To be fair, when Chakrabarti talks about the demand for large buildings, he’s referring at least as much to commercial structures. Most developers and planners, as evidenced by the recent news about rezoning midtown Manhattan, believe that older office buildings, with their smaller floor sizes, lower ceilings and outdated, inefficient mechanical systems are not upgradable to modern “Class A” standards. There are complex environmental and economic equations at work here looking at, among other things, the amounts of energy and materials already embedded in those existing buildings versus their demolition and replacement. Backing up the midtown plan, Terrapin Bright Green – a notably environmentally-minded consultancy — found that for many of the current buildings, their totaled drawbacks in terms of both usability and energy-efficiency outweighed the benefits of preserving and improving them. And it’s useful to point out that this is in the shadow of the mother of all preservation battles, Grand Central Station, as well as occurring simultaneously with a new push to rectify the mistake-we-learned-from: tearing down the nearby Penn Station. This comparison, though, focuses only on economic health, not social health — not what he calls “civic delight.” The gauge for that might be the simple question: which place would you rather live? As I’ve oft-stated, my own strong preference is for the low-rise, street- and community-oriented urban fabric found in places like the Lower East Side of Manhattan, where I live and work. 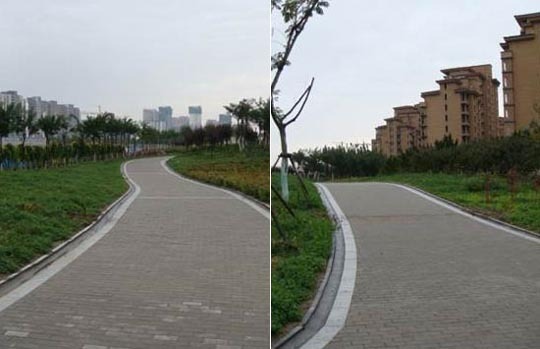 The concept of urban “walk appeal” tends to arrive at similar conclusions. But how then to incorporate urban population growth, along with its attendant office, retail and service needs, without resorting to forests of unrelenting towers — towers that serve to remove urban vitality from its place of community, the street , in favor of shepherding people through characterless lobbies to anonymous enclaves in the sky? How do we promote both civic delight and economic growth? It’s a question that demands an EcoOptimistic answer. Chakrabarti touches on one solution – what he refers to as “cap and trade zoning” – which has a strong relation to a solution I’ll outline shortly in Part 3. 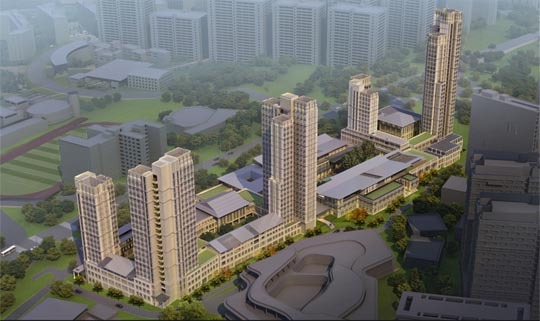 This entry was posted in Community, Urbanism and tagged density, Vishaan Chakrabarti on June 20, 2013 by David Bergman. Far too many environmental conferences and discussions are repetitive and uninspiring. Frequently, we find ourselves preaching to the choir, perhaps just trying to impress each other. Then, every once in a while, an event manages to bring together the right “vibes,” and that’s when ideas can coalesce and energize. I found myself in one of those happy circumstances this past weekend at “Understanding Urban Sustainability: One Block at a Time,” hosted by the Cooper Union Institute for Sustainable Design (CUISD) and the Fourth Arts Block (FABnyc). The Fourth Street Arts Block is within shouting distance (trucks, buses and horns notwithstanding) of Cooper Union. 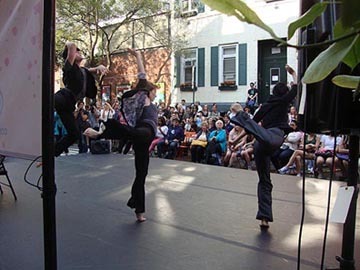 The block is home to several Off-Broadway theaters (among other productions, “Rent” began there) as well as typical NYC tenements, many with residents whose families have lived there for generations. It’s also adjacent to the Bowery, which is undergoing a Renaissance – probably its first ever – with hotels and museums replacing flophouses and used restaurant supply stores. The block is the only official “cultural district” in NYC, but what interested me is that FABnyc has also embarked on a mission to green the block. To that end, they have a project with Cooper Union “to generate new and innovative solutions to the complexities of urban sustainability.” In addition, their “Model Block” program has undertaken energy efficiency steps such as enabling buildings on the block to install white roofs and obtain energy audits. At the event, the questions revolved around what else FABnyc could be doing and how it might be looked at as a model for other blocks. As the discussions evolved, several topics I’d been pondering began to come together. In my recent columns (here, here and here) on the Lower East Side redevelopment project called SPURA, I spent a fair amount of time discussing neighborhood and street vitality, focusing on how monolithic buildings and big box stores sap energy compared to the way older “Main Street” type designs work. This is not news, of course. The realization has been around since Jane Jacobs wrote about it and, in more recent years, Andres Duany and Elizabeth Plater-Zyberk have concentrated on it as has Kaid Benfield (though his recent posts have lamented that Main Street’s future may not be all it’s cracked up to be). Fourth Street’s architecture is pretty intact in that the buildings are walk-ups and most have storefronts on their ground level. So there is a constant level of activity and interaction involving residents, shop owners, dog walkers, theater attendees and others. The stores range from a small scale food co-op that’s been there for decades to a newcomer artisanal chocolate shop (highly recommended!). When the street is closed for a festival, it’s not the typical characterless affair that abounds in NYC summers with sock vendors and greasy food, but instead has performances, local artists selling jewelry and classes to teach kids to ride bicycles. What’s the connection to sustainability? One of the biggest issues in sustainability is disengagement. Many, if not most, people feel that any efforts they might be able to undertake are too difficult or, more commonly, too insignificant to matter. Living (or working) on a block or in a neighborhood where anonymity is the rule discourages any sense of ownership, of belonging to something larger than just you. Simultaneously, this means you have less incentive to participate and less sense of responsibility to a community. This can contribute to any number of “quality of life” problems like noise and littering. If you don’t know your neighbors, you’re less likely to care. It’s fairly apparent that a key to sustainability is popular support and participation – buy-in, some call it. Active street life can foster this in ways that high-rise apartment buildings, even when built to the street line, and towers-in-the-park cannot. For instance, one of my suggestions for future projects was a block collection system for compost. NYC currently does not have compost collection (though they’re looking into it). In the meanwhile, residents have to store their compost at home (keep in mind that most of us do not have outdoor space) and then take it themselves to a collection center on appointed days. That’s too much work and too much icky-ness for most. But if communities were to set up local, perhaps self-run systems, my bet is many more would participate – even without the “stick” of government requirements – and we might even see friendly competition to see whose building composts and recycles the most. At the end of the event, I brought up that this was an almost perfect application of the old environmental slogan “Think Global, Act Local.” Strengthening communities can get people out of their individual shells and lead to more involvement in and buy-in of local eco practices, which in turn can get people thinking on the larger global level since the world is, after all, just a much larger community. This entry was posted in Community, Urbanism and tagged density, Superstorm Sandy on February 27, 2013 by David Bergman.